Diabetes is a metabolic disorder characterized by chronic hyperglycemia, which leads to long-term complications affecting multiple organs. In India, it is estimated that 61.3 million people aged 20-79 years live with diabetes (2011 estimates) which is expected to rise to 101.2 million by 2030. Glycosylated hemoglobin (HbA1c), a marker of chronic hyperglycemia, is the standard measure for monitoring glycemic control., HbA1c level is an indicator of average blood glucose concentration over preceding 2–3 months and has been suggested as a diagnostic and screening tool for diabetes in general population.,, Although the normative distribution for HbA1c levels has been described and standardized for adults in the developed countries. but HbA1c status and its associated factors among Reproductive age women has been less explored. Hence the present study was conducted with the objective to identify the baseline mean HbA1c level among reproductive age women in Tripura and to study the factors associated with high HbA1c level among them. This community based cross-sectional study was conducted in the northeastern state of India, Tripura; among reproductive age women between 15 to 49 years of age. The study was conducted using cluster sampling technique and 30 clusters were selected from the state using probability proportionate to size (PPS) sampling method; by calculating the cumulative population according to Gram Panchayet and Nagar Panchayet population records. 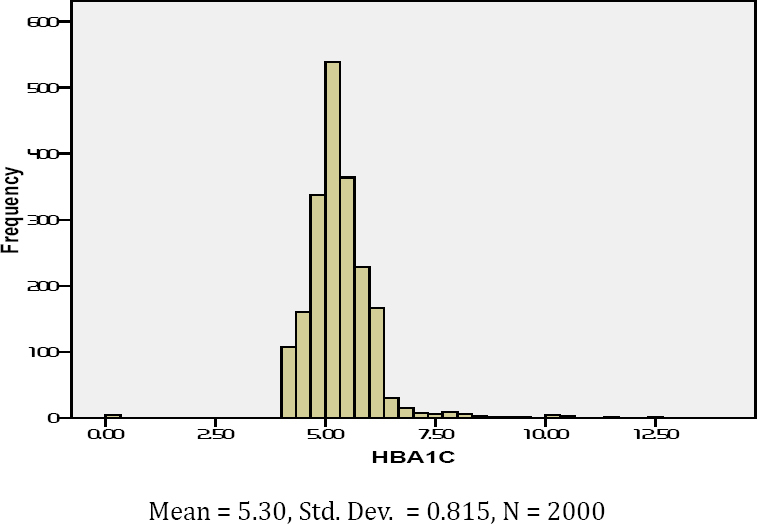 Sample size was calculated considering the mean HbA1c level to be 4.99% in general population, with Standard deviation of 0.50% and an absolute precision (E) of 0.04, at 95% confidence interval, and the minimum required sample size to estimate the baseline mean HbA1c level was calculated to be 600, using the formulae, N = Z21-α/2 (S.D.)2/E2. But since, cluster sampling through PPS technique was considered, hence, the sample size was multiplied with a design effect of 2 and calculated to be 1200. However, in the present study 2000 reproductive women were included which was above the minimum required sample size. Approximately 66 number of eligible female were selected by simple random sampling technique from each cluster to include 2000 reproductive age females in the present study. Data analysis has been done in Epi info version 7.0 and data has been expressed in frequency and percentage. Statistical analysis has been done using chi square test and multiple logistic regression analysis and p value of < 0.05 was considered to be statistically significant. The study was conducted as a part of the study titled “Prevalence of anemia and chronic energy deficiency in women of Tripura” which was approved by the institutional ethics committee of Agartala Govt. Medical College [Ref No. : F.4(5-2) /AGMC /Academic /Project /Research /2007/Sub -II/9272-77. Dated: 20.11.2012]. The present study revealed that the Mean HbA1c level among the reproductive age women of Tripura was 5.29% (34 mmol/mol or 105 mg/dL) with a standard deviation of 0.83% [Figure 1]. The present study also revealed that 1921 participants (96.05%) had normal HbA1c level whereas the remaining 3.95% (N=79) participants had clinically relevant HbA1c level. Univariate analysis revealed that 8.43% females in the age group of 45 to 49 years had high HbA1clevel and age of the females was significantly associated with HbA1c status. The study also showed that the community of the participants was significantly associated with high HbA1c status with the local tribes (Scheduled Tribe) of the state showing lower prevalence of raised HbA1c level. A per capita monthly income of ≥Rs 5000 had high HbA1clevel, and income was significantly associated with the HbA1c status (p value- 0.00). Again, married women had high HbA1c level and it was statistically significant (p value- 0.03) [Table 2]. Considering the significant variables of the univariate analysis as independent variables multiple logistic regression analysis was conducted as shown in [Table 3]. Women who belonged to 45 to 49 years age group had 6.67 times (1.46-30.45) and women between 40 to 44 years age group had 6.26 times (1.28-30.48) more chance respectively of having high HbA1cstatus compared to women in the age group 15 to 19 years. Scheduled tribe women of the state had 57% less chance [OR- 0.43 (0.22-0.81)] of having high HbA1c status compared to women from general category. Women belonging to family with per capita monthly income of less than Rs 2500 had 69% less chance [OR- 0.31 (0.13-0.73)], and per capita monthly income of Rs 2500 to Rs 4999 had 75% less chance [OR- 0.25 (0.08-0.75)] of having high HbA1c status compared to women belonging to family with a per capita monthly income of ≥Rs 5000. The present study also revealed that the Mean HbA1c level among the reproductive age females of Tripura was 5.29 ± 0.83 %. This finding is high compared to a study conducted by Jinan B. Saaddine et al where mean HbA1c level was 4.99% (SD 0.50%) and varied from 4.93% (±0.04) in non-Hispanic whites to 5.05% (±0.02) in Mexican-Americans to 5.17% (±0.02) in non-Hispanic blacks. This variation may be because the study was conducted among children and young adults unlike the present study which include young adults and adults. The study showed that, age was significantly associated with high HbA1cstatus and women in 40 to 49 years age group had significantly higher chance of having high HbA1cstatus compared to women in the age group 15 to 19 years. Similar finding was obtained from a study conducted by Lydie N. Pani et al on the Framingham Offspring Study and the National Health and Nutrition Examination Survey cohorts, where HbA1c levels were positively associated with the age of the non-diabetic subjects. 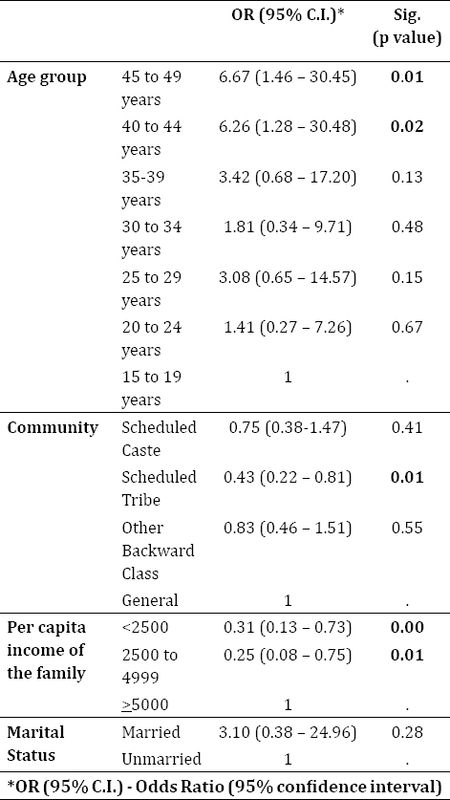 Again similar finding was obtained from studies conducted by John B Buse et al and Hajame Haimoto et al where HbA1c level was significantly associated with age of the respondents., In a study conducted in Vellore, India the scheduled caste appeared to be the most susceptible to develop uncontrolled diabetes compared to other castes like scheduled tribe and general caste. But the present study revealed that women who were scheduled tribe had 57% less chance of having high HbA1cstatus compared to general caste. This may be due to the fact that scheduled Tribes are less affluent and more hardworking people in the state compared to general category. Again the present study revealed that women belonging to poor socio economic status had less chance of having high HbA1c level. This finding can be explained with the fact that diabetes is usually associated with affluent economic status. Thus the present study provided the reference values for HbA1c distribution among reproductive age women (15-49 years) in Tripura and also revealed that age, community and income of the respondents had a significant influence on HbA1cstatus. Hence, the present study may be useful in the early identification of at-risk individuals and patients with Diabetes Mellitus at the community level and thereby help in prevention of diabetes mellitus and reduce the burden of its complications and health care costs in India. The study was carried out on large sample of reproductive age women with cluster sampling with PPS technique in the difficult areas of this North Eastern State of India. Though Nycocard Reader has high sensitivity and specificity, still chances of giving false positive and false negative result cannot be excluded. There are no conflicts of interest involved in the study. International Expert Committee: International Expert Committee Report on the Role of the A1C Assay in the Diagnosis of Diabetes. Diabetes Care 2009, 32(7):1327-1334. Jinan B. Saaddine, Anne Fagot-Campagna, Deborah Rolka, K.M. Venkat Narayan, Linda Geiss, Mark Eberhardt. Distribution of HbA1c Levels for Children and Young Adults in the U.S. Diabetes Care, August 2002; 25 (8): 1326-1330. Singh T.P, Singh A.D, Singh T.B. Prevalence of diabetes mellitus in Manipur. In: Shah S.K. ed Diabetes Update Guwahati, India. North Eastern Diabetes Society, 2001,13-19. Sadikot SM, Nigam A, Das S. The burden of diabetes and impaired glucose tolerance in India using the WHO 1999 criteria: prevalence of diabetes in India study (PODIS). Diabetes Res ClinPract 2004; 66:301-07. Sadikot SM, Nigam A, Das S, Bajaj S, Zargar AH, Prasannakumar KM, et al. Diabetes India. The burden of diabetes and impaired fasting glucose in India using the ADA 1997 criteria: prevalence of diabetes in India study (PODIS). Diabetes Res ClinPract 2004; 66: 293-300. Lydie N. P, Leslie K, James B. M, Cynthia D, Shadi C, Caroline S. F, et al. Effect of Aging on A1C Levels in Individuals Without Diabetes. Diabetes Care. October 2008; 31(10): 1991-1996. Bose J, Kaufman F, Linder B, Hirst K, Ghormli L, Willi S. Diabetes Screening with Haemoglobin A1c verses fasting plasma glucose in a multicentric middle-school cohort. Diabetes care. Feb 2013; 36: 429-435. Haimoto H, Tae S, Kawamura T, Umegaki H, Komeda H, Wakai K. Three-graded stratification of carbohydrate restriction by level of baseline hemoglobin A1c for type 2 diabetes patients with a moderate low-carbohydrate diet. Nutrition & Metabolism. 2014; 11(33).